Water in the Los Angeles River has been raging this week, rising to levels far above historical averages thanks to spates of rain in January and February. The rain has filled up storm drains and given residents a visible reminder of why the U.S. Army Corps of Engineers surrounded the LA River with thick walls of concrete in the 1930s. Just a tiny stream during dry months, the river becomes torrent-like in wet weather, and caused frequent flooding along its 51-mile course before the concrete channels were installed. The volume of water in the northern section of the river peaked late Saturday morning, when 11,000 cubic feet of discharge (around 82,000 gallons) were recorded every second, according to the U.S. Geological Survey, which tracks water levels at the Sepulveda Dam, near Sherman Oaks. At the Sepulveda Dam, Saturday’s water level was 152 times higher than the February 2 average. The volume of water was only slightly below levels recorded on March 2, 1938, when the river carried 12,000 cubic feet per second. By the time it reached Long Beach, 99,000 cubic feet of water were surging through the river, causing floods that wiped out thousands of homes and killed nearly 100 people. That catastrophe led directly to the creation of the formidable channels that now contain the shape-shifting river. Those channels were carrying water at levels creeping toward capacity over the weekend. On average, the amount of water flowing in the river on a given day measures 320 cubic feet per second along the whole river. In Studio City, water levels rose to over 20,000 cubic feet per second over the weekend, according to the National Weather Service. 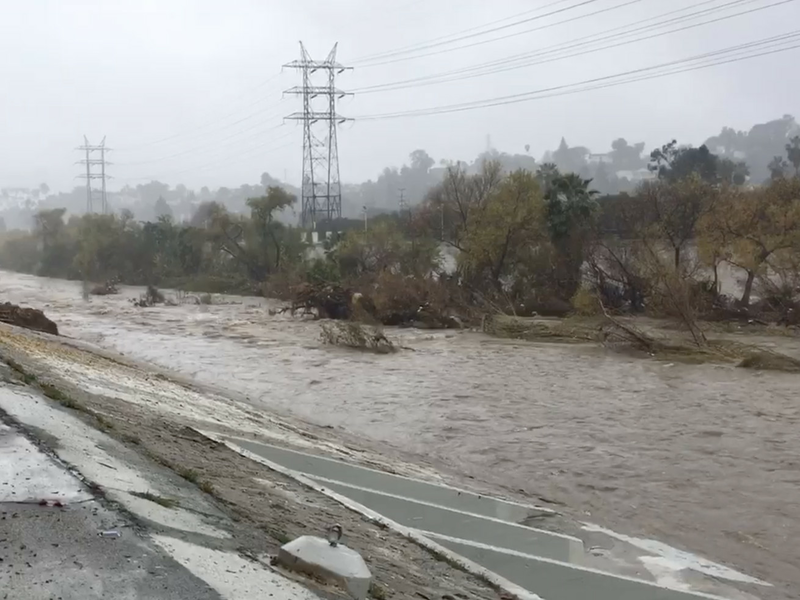 The river picks up huge volumes of water from tributaries as it winds south toward Long Beach, where the river hit the 13-foot mark Saturday afternoon. At 15 feet, authorities begin flood preparations, and at 17 feet, flooding could occur. Class III rapids at the LA River today!